Cobra Cuffs » Protective Solutions, Inc.
COBRA CUFFs are an entire new chapter in the book of disposable restraining devices! They are so far ahead of other flex-cuff style products available. 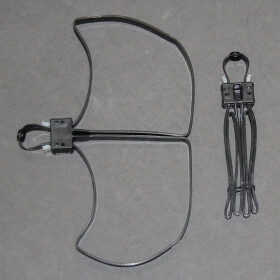 Image shows 1 set of cuffs folded and 1 set of cuffs opened. Quickly subdue suspects with easy to use Cobra Cuffs. Once deployed, the Cobra loop automatically opens and makes synching the loops around the wrist extremely effortless. Riveted straps provide extra leverage to control prisoners. Double-Lock helps reduce liability due to accidental over-tightening common with standard zip ties. Disposable - Reduce transfer of disease with a clean cuff each time. Made of engineered polymers that are strong and UV resistant.